Track lighting is a bit more demanding as compared to conventional lighting fixtures. The installation requires expertise and the access to appropriate track lighting accessories and spares. 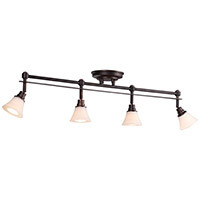 We have the largest online inventory for track lighting accessories. This includes kits for contemporary, traditional, monorail, and tech monorail lighting tracks. From track heads in different styles and sizes to linear track sections and connectors, we have every thing you need to make your track lighting system more versatile. Choices include complete and pre-assembled kits and perfectly fitting parts for existing tracks. These safe, state-of-the-art products are essential to keep track lighting systems functional for a longer time with the assurance of optimal performance. Track Lighting and Kits There are 254 products.